Heres my first sword ever in-game. It doesnt even have a texture on it yet, i just needed to see if i could get it in game, and i like it. Once i redo the texture, and modify the sword to make it more 'deadly', because i didnt make this sword for this mod, it was an earlier estoc id made. You like? FYI if clicking on the link for the song doesn't work, copy and past it into the address bar. Can you help me a little. 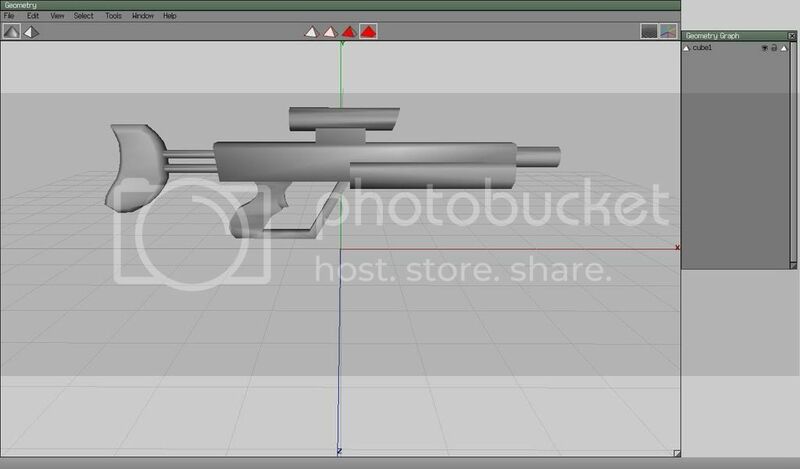 After modeling in ACAD, what you must do, to import ACAD picture to MB? What kind of scripts work are you planing? Right now, we're not working at scripting at all, since we dont have a scripter, and i onlu know the basics. For now, we're jsut going to get the items ingame, change the map, and basic stuff like that. Im not quite sure what we're planning, since we havnt gotten that far yet, ill let you know when we do. Erm...i all suddenly forgot what to do after that...there is a tutorial somewhere on it though. You'll need 3dsmax at end. I don't have latest version of ACAD on my table right now, but I think that you can export just .3ds. If you will need some help with ACAD you can ask me. And don't forget that in ACAD you can use scripts. It's much faster than hand drawing. But it is true, that I writing ACAD scripts with c++. 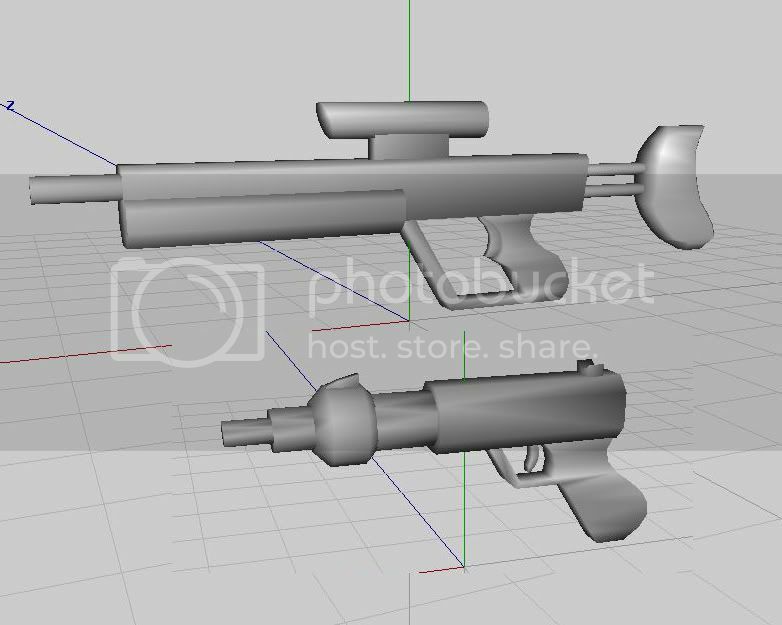 Here's a Laser Rifle I whipped up. Sitting at about 650 polys. No, don't make the barrel smaller on an energy weapon. You want the barrel to look like it contains a bunch of electromagnetic coils and a cooling system or something. Simple round steel barrels are a mark of conventional rifles. I thinned the barrel down a bit and created a pistol to go along with it. Well, at any rate, I have both versions available. So whichever is preferred can be used. They look good, anyway. Simple, direct - the kind of thing that soldiers would carry. Don't know if this is useful but this can either be a Flame Thrower or perhaps a chemical based laser.